Tag Archive | "The Jewel of Tetras"
The Congo Tetra (Phenacogrammus interruptus) is a strikingly beautiful fish considered by most tropical fish keeping enthusiasts as the crown jewel of tetras. Congo Tetras are large, peaceful, full bodied fish with shimmering long flowing fins and large iridescent scales. Their base coloration is silver with an orange like glow. The actual background color of the fish is silver, but the bottom half is suffused with an aquamarine blue and the upper portion more of a gold color. As the fish grow older and larger, these colors become more vivid. In dominant male Congo Tetras, the colors are more pronounced and their fin edges become more extended. The tails of all male Congo Tetras grow very long and feathery and with mature fish, it is an easy matter to differentiate the males from the females. 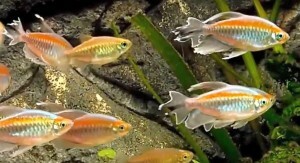 Congo Tetras are one of the few “tetras” that come from Africa. They are found in the central Congo River Basin in large shoals. In an aquarium environment, Congo Tetras do best in moderately planted tanks with driftwood in groups of six or more fish. They are an active fish and make a breathtaking display in a large, long aquarium. They enjoy swimming in and out of plant thickets and prefer hanging under shaded areas provided by floating water plants. Congo Tetras are ideal fish for a peaceful community tank and get along fine with other non aggressive species of similar size. They are easily frightened by loud noises and aggressive tank mates and may wait for you to leave the aquarium before they will feed. The Congo Tetra requires soft, peat filtered water and a darker substrate. Since they are schooling fish they need a large aquarium to thrive and display their full beauty. Anything less than 30 gallons is not suitable for keeping these fish happy. Congo Tetras are omnivorous and will accept many small foods such as brine shrimp, daphnia, freeze-dried bloodworms, tubifex, micro pellets, and high quality flakes. Little is known about the Congo Tetra’s breeding habits in the wild except that they are egg scatterers. They are seldom bred in captivity however they are commercially farmed through out the Far East for the aquarium trade and minor color variations are occasionally available for sale. In captivity, a large aquarium with peat-filtered water and bright lighting may induce spawning. If this occurs, they will lay up to 300 eggs that will drop to the bottom. Separate the adults from the eggs or they may be eaten and since the eggs are vulnerable to fungi attack, they should be treated with a fungicide. When hatched, the fry are large enough to eat freshly hatched brine shrimp. 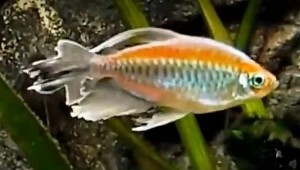 Congo Tetras are moderately priced and offered for sale when they reach 1-1/2″ to 2″ in size.